Will 'Cam' be to Cameron what 'Maggie' was to Mrs T? "Cam: Davis Tax Pledge Is Reckless"
That headline is taken from today's Sun. During the last leadership race The Sun tried 'Smithy' for a while but soon adopted IDS like nearly every other headline-writer. DC (another option?) is known by his friends as Dave. Will we soon be reading 'Dave appoints Jeremy Clarkson as Transport Spokesman' or 'Top Tory Dave Slashes Links With Delors-Like EPP'? Perhaps not. "There is an entertaining parlour game played by the Notting Hill set Tories who surround the leadership front-runner David Cameron. They imagine themselves as members of the Fellowship of the Ring, Tolkien's group of brave underdogs out to save Middle Earth (for which read Middle England) from the forces of Mordor (it even sounds like Labour). 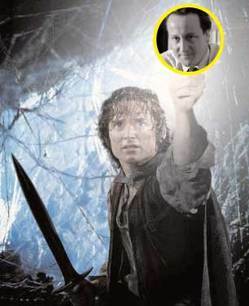 It is an absorbing pastime once you get started: Cameron is Frodo, the fresh-faced, wide-eyed hobbit driven to oppose the evil Sauron, the dark lord of Mordor (Gordon Brown), successor to the fallen angel Morgoth (Tony Blair). Gandalf, the good wizard, according to one Cameron supporter who has played the game, is Oliver Letwin, the senior figure in the group, dispensing wise counsel." Is Michael Gove behind this? I know he's a Tolkien enthuasiast. We should be told. I prefer Harry Potter - he advocated a private currency like Hayek. Gove looks a bit like Golum. As much as I admire Letwin it is a bit worrying that he is seen as a senior figure. He has only been in the Commons since '97. If I were DD I'd ask to be Aragorn. So who is Maggie T? Shelob? Does this mean that Michael Hestletine is Gandalf? If Tony Blair is Sauron it would be as well to remember that it was Melkor who was chained by the Mighty to be released to conquer and subjugate Middle Earth as part of a prophecy where Sauron had not quite succeeded so is Gordon Brown Melkor? Not sure that Robert Kilroy Silk was of sufficent significance to be compared to Saruman? Not only this but it was Aragorn who became King not Frodo and who is Aragorn? And the Dwarves - are these the Liberal Democrats? Maybe the Ents are the DUP? The Balrog presumably is John Prescott and the Orcs Labour activists? And Michael Howard - Steward of Gondor, presumably the Nazgul are Labour cabinet ministers and Charles Clarke the Cave Troll? Surely Mrs Thatcher would be Isildur? Frodo had the quest to save Middle Earth. Aragorn just looked after one Kingdom, that of Man. Liam Fox perhaps. Someone who knows societies problems and is wary of problems outside of Man's shores? You;'d never think a hard hitting political site which has in recent discussed some very technical political issues such as euthansasia, tax and economic policy and abortion, would be comparing Tories to the Fellowship of the Ring!!! Treebeard and the Woodfolk would be the Tory peers, led by the Shadow Leader of the House of Lords. Grima Wormtongue...an adviser who poisons minds...Alistair Campbell. Who seriously believes he doesnt give advice at the moment to Labour? John Bercow is Gollum. Michael Portillo is Saruman. Shaun Woodward is Wormtongue. John Prescott is Ugluk. Ian Macartney is Shagrat. Ben Bradshaw is the Mouth of Sauron. David Davis must be Boromir. Ian Macartney is not good looking enough to be Shagrat Sean.But I'm sure you're being nice, because as we both know we shouldn't mock the afflicted! Some wrong suggestions on this thread, so far. Shelob can only be Helen Brinton; the Cave Troll has to be the Speaker of the House of Commons. Michael Hesseltine is a more plausible Bilbo (just before he left for Valinor). Mrs T is Galadriel. Veritas would definitely be the Urukai. Maybe the EU would be more appropriate as Mordor with the DUP as the Fellowship. I know this is not on topic, but I just wondered if the differences over fishing policy have been covered here. It would appear that clear differences in policy have emerged over a crunch issue for eurosceptics. Gove a Tolkein fan? Oh dear. Every time I start thinking I could warm to Gove (ie when he starts talking on foreign policy and I forget for a moment his uselessness on the domestic front), along comes something new. "I just can't hold it back any more; I love Tony Blair!" And now it's the Tolkein stuff. It's that odd little adolescent streak. It's very worrying. The idea of the Notting Hill set huddled like a gang of spotty adolescents in public school imagining they are a world-saving fellowship just fills me with disgust. Editor, this Tolkien information has been absolutely invaluable. I never could get to the bottom of why I instinctively found this group so creepy. Apologies to all the rest of you who appear to be so familiar with the cast of characters in this yucky little fantasy world. It's obviously something wrong with me, some failure to connect with the true force. Few people are neutral about LOTR, Buxtehude. People either love it or loathe it. "Yup Bux, I wonder if they're Dungeons and Dragons freaks too..."
I would lay money on it. Not policy, but trivia.